Ford has announced the sportily styled Kuga ST-Line, which goes on sale in September and is priced from £24,845. It features a gloss black grille and rear skid plate, black window beltline and black alloy wheels, along with part leather sports seats. The suspension has been lowered 10mm versus a standard Kuga, plus there are thicker anti-roll bars, stiffer bushes and revised spring and damper rates to give a more precise and responsive drive. All of the Kuga engine range is offered with ST-Line trim. Diesel options are a 1.5-litre with 120PS and emissions of 115g/km, plus there is a 2.0-litre TDCi with either 150PS or 180PS. The 150PS engine can be specified with front- or all-wheel drive, while the 180PS engine comes with all-wheel drive only. Petrol engines are available with 120PS, 150PS or 182PS, with emissions from 143g/km to 171g/km. The Kuga ST-Line joins the similarly-styled Fiesta, Focus and Mondeo ST-Line variants, priced from £15,645, £20,595 and £24,745, respectively. 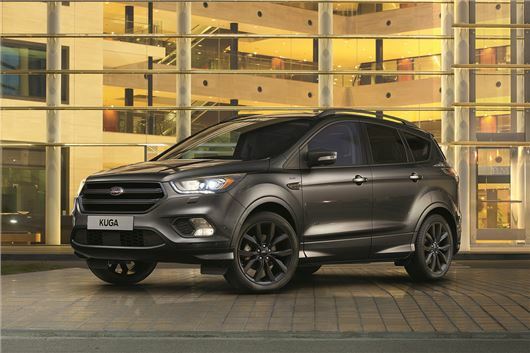 First deliveries of the Kuga ST-Line are due before the end of the year.